What is a High Performance Airplane? A high performance airplane is defined as an airplane where each individual engine is capable of producing more than 200 horsepower. Most high performance propeller-driven aircraft fall into this category. Special skills and techniques are required to safely operate a high performance airplane, and therefore special training is required. Training emphasis will be placed on proper powerplant operation and their associated systems. 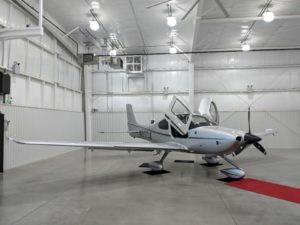 Beverly Flight Center has one high performance aircraft in its fleet and offers the required training to fly it. Training will consist of both classroom sessions on the ground as well as sessions in the aircraft. All flights will be training flights with an instructor on board. There is no minimum flight hour requirement set forth by the FAA to complete the transition training. Successful completion of the training will be at the discretion of the instructor. At the completion of the training you will receive a one-time written authorization in your logbook to fly high performance airplanes; no FAA exam is required. Training will be conducted in our 2017 Cirrus SR20 G6 with 215hp.